Since I haven’t been able to do a full cryptid post for a while, here’s a short one. 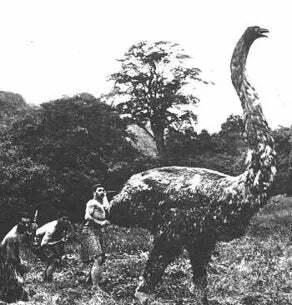 “Pictured” to the left is a Moa, a giant wingless bird native to New Zealand and Australia. Now, Moas really existed but were hunted into extinction in the late 1500’s. What makes them a cryptid is the long held belief that the birds still exist today. Very little evidence of that actually exists but believers still hold strong that the giant birds still roam Australia. So how’s things going? How was everyone’s weekend? I’m mostly getting ready for Christmas, while working is calming down a bit. Might still be a little while before you see my regular comics book posts though, sorry. Speaking of- Guardians Team Up, Robin War, Star Trek, Street Fight, Pathfinder, and Kodansha Manga are all on sale on Comixology. Go check them out!